This Chatham House report by Leena Koni Hoffmann and Raj Navanit Patel uses a social norms approach to analyse the drivers of corrupt behaviour in Nigeria. It is estimated that close to USD 400 billion was misappropriated from Nigeria’s public accounts from 1960 to 1999. Illicit financial flows from the country between 2005 and 2014 are estimated to have totalled some USD 182 billion. Corruption tends to foster more corruption, perpetuating and entrenching social injustice in daily life. The report presents new evidence of the social beliefs and expectations that influence some day-to-day forms of corruption. 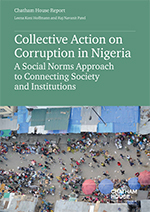 Nigeria’s entire system of anti-corruption laws and policies could operate more effectively if they more deliberately address the beliefs influencing collective behaviour. Collective grassroots pressure could help shape positive social norms and make anti-corruption efforts more effective.